Se rappeler and se souvenir are almost complete synonyms. I can’t really think of any occasion on which one can’t replace the other. However, there is a grammatical difference which fewer and fewer people observe these days. Se rappeler takes a direct object and se souvenir doesn’t. So what does that mean? 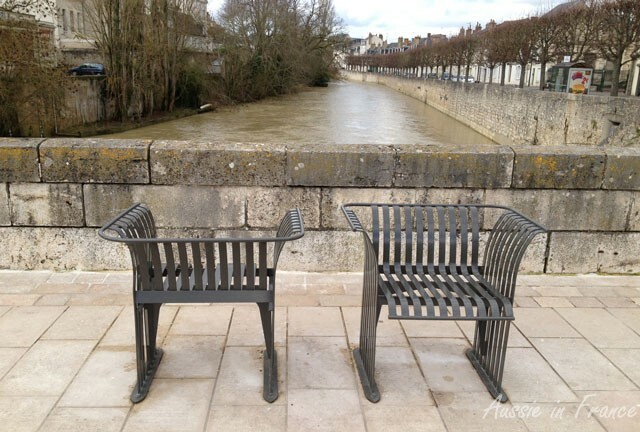 A pair of chairs in Vendôme – nothing to do with memory but I like the photo. I remember my grandparents well = Je me rappelle bien mes grand-parents OR Je me souviens bien de mes grand-parents. The difference is that little “de” which most people also tack onto se rappeler. I remember him = Je me le rappelle OR Je me souviens de lui. But, you mostly hear Je me rappelle de lui which is totally incorrect. I try to remember not to use “de” with se rappeler but when everyone else around me is using it without the slightest hesitation, it’s not easy because it sounds odd. So I usually use se souvenir! You can use rappeler without the reflexive, but not souvenir. While se rappeler means to remember, rappeler means to remind someone of something. Note that while we say “of” in English, THERE IS NO DE IN FRENCH. Tu me rappelles ma tante = You remind me of my aunt. Cela ne vous rappelle rien = Doesn’t that remind you of something? Rappelez-moi votre nom = [Literally: remind me of your name] and really corresponds to “Sorry – can you tell me your name again” which is a VERY useful phrase to know if you forget names the way I do. Another verb that can also be used for “remember” is penser à.
Tu me fait penser à ma tante = You remind me of my aunt. Cela ne vous fait pensé à rien ? = Doesn’t that remind you of something? Fais-moi penser à rappeler mon frère = Remind me to ring my brother back. Which reminds me that rappeler has another meaning i.e. to call back, where the “r” is like “re”, widely used in French to mean again. Ses affaires l’ont rappelé à Paris = He was called back to Paris on business. Ma mère a été rappelé au chevet de mon grand-père malade = My mother was called back to my sick grandfather’s bedside. [which is interesting because a chevet is a bedside table). Souvenir is also a noun of course, with the meaning we know in English, as in souvenir shop. But its main meaning is “memory”. Elle a gardé de lui un bon souvenir = She has good memories of him. Ce n’est plus qu’un mauvais souvenir = It’s just a bad memory now. Je n’ai qu’un vague souvenir de l’incident = I only have a vague recollection of the incident. Il m’a raconté ses souvenirs d’enfance = He recounted his memoires of his childhood. But isn’t mémoire a French word, I can hear you saying. Doesn’t it mean memory? First, it can’t be used in any of the above examples. Souvenir is used when it means “something remembered” while mémoire is used when talking about what our brain does. Elle a une bonne mémoire = She has a good memory. Il a une mémoire d’éléphant = He has a memory like an elephant. Je cite de mémoire = I’m quoting from memory. C’est inquiétant, elle perd la mémoire = It’s very worrying – she’s losing her memory. A very useful little phase is pour mémoire which means “as a matter of interest” “for the record”. Mémoire is also the term used for a computer memory. And just to make matters easy, there is a another word mémoire, but this time it’s masculine and it has a completely different meaning! It can be used for a memorandum, a report, a statement of all the money owed by a customer to a company (you probably don’t need to remember that! ), someone’s memoirs and, most importantly for me, a master’s thesis or dissertation. For about six years during my career as a university lecturer, I was in charge of the dissertations at ESIT and I could never remember whether the word mémoire was masculine or feminine! I devised all sorts of strategies so I wouldn’t reveal my lack of certainty! For example, instead of saying “Son mémoire est en retard” (her dissertation is late), I would say “Elle a dépassé la date limite” (she’s gone over the deadline). Now who would like to have a try at translating the four phases in bold in the post? Answers next week! This entry was posted in French language and tagged Friday's French. Bookmark the permalink. So interesting. Admire your depth of knowledge of French – it’s so difficult to attain this level of understanding of a foreign language. They say you have to marry a native speaker! Which is what quite a lot of young diplomats do if they want to specialise in Mandarin or Japanese or Thai, for example! There’s also aide-memoire, often used as a term in diplomacy! Cheers, Pamela – and have a good weekend! I do have to plead guilty to a French boyfriend when I was still at university in Australia and two French husbands since then! Interesting that “aide-memoire” is used in English. You can also say “pense-bête” on a less formal level. Je me suis fait un pense-bête pour ne pas oublier de l’appeler. = I made myself a reminder so I wouldn’t forget to call him. No wonder your French is so good! Could you do a post on amener, emmener, apporter? I can’t find a good explanation that won’t get my adult students more confused. I can try! Though since a lot of people confuse bring and take in English, it might not be that easy. I try to remenber not to use “de” with se rappeler: J’essaye de me souvenir de ne pas utiliser l’adverbe de avec se rappeler. I agree with all but the last: je ne me rappelais jamais si le mot mémoire est masculin ou féminin. We often use “could” or “can” in English where it wouldn’t be used in French. Can you see him? Est-ce que vous le voyez? How interesting! I’m a native French speaker (Canadian) and I learned something today 🙂 Thanks for sharing your knowledge of the beautiful, but sometimes hard, French language. My husband and I are speaking French at home so our sons learn it (we live in California now) but this is not an easy task let me tell you. Our sons find the English easier, and, of course, way more useful over here. But we keep working on it! Hello Melanie, and tThank you! With your kids, you have to tell yourselves that their passive knowledge will one day become active when they are more motivated. Both my kids have a very high level of bilingualism. I’ll have to tell their story some time. You touched on a prickly French problem I’ve been having for a few years: the intrusive DE after se rappeler. It is wrong according to grammar books but, when I ask my French friends about it, they say that no one would say it without the DE. They all say it and so do the scholars on TV5Monde. When I teach those two verbs to my students, I explain the situation to them, giving them the choice between sounding like a book or like the French people they’re visiting. Do we want to speak prescriptive or descriptive French? … As for the amener, emmener, apporter that Jacqueline asks about, the French are also defying the rules there! Hi Susan, if I asked the question on my French translators’ list, you can be sure that they would all say you shouldn’t use DE after se rappeler but they are purists. It’s like the subjunctive after après que which practically everyone uses these days, despite its theoretical incorrectness. However, I’m not sure correct usage in these two days would even be noticed if your students were to use it. A post on amener, emmener and apporter is going to be interesting, particularly as so many people confuse bring and take in English. What about “(se) remémorer”. When would one use these vs “(se) rappeler”. La cérémonie avait pour but de remémorer les douleurs du passé. Les anciens amis se remémorent les bons souvenirs. In the first example, I think we’d be more like to use commemorate otherwise remember. For the second example, I think I’d also use remember. We could say recollect or recall but it’s on a higher register. And the difference between “remémorer qch” and “commémorer qch”? Well, commémorer is the idea of remembering something with a ceremony (commémorer l’armistice de 1918), as in our commemorate whereas remémorer is only recall (ce village lui remémorait sa jeunesse). In all the years I have lived here (over 40) I have never heard anyone use the word remémorer.